Well, first this is not really a demo. There is no music, no scroll text, no particularly interesting things to see, and even worse: this is interactive ! The only interesting thing in this demo is that for the very first time (I guess at least), it shows an hardware accelerated (kind of: I just consider that since it is not software deaccelerated in some ways it could be considered as hardware acceleration) double buffering, associated to a perfect vertical synchronisation running at a flawless 50hz. 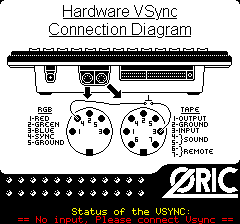 The fact is the Oric does not have such thing as a VSync interrupt. You can set a 50hz timer, sure, but you never know where the electron beam is at a particular moment, so you have no chance to be sure that what you are currently drawing is before or after the electron beam, resulting in some nightmarish animation and flickering sprites. ...the awesome thing is that this works perfectly, despite the fact that the SYNC pin transmit the vertical synchronisation as well as the horizontal one. Fortunately the filters in the ADC flatten out the horizontal sync parasites, and all that remains is a perfectly neat impulse every vertical blank. This being this, everything is not perfect. 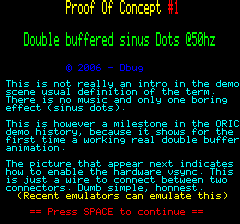 Ok it is now possible to draw things on screen knowin where the beam is, but it is quite hard to make a display routine efficient enough (in 6502 that's it) so it can draw everything from left to right and top to bottom so it never get passed over by the electron beam. We need double buffering for doing that nicely. And well, on the oric there is no such thing as double buffering, for a very simple reason: you cannot change the start adress of the video memory. Whatever you do the high resolution video mode starts in $A000 and the text video mode starts in $BB80. And this work, as you can see in this simple demo. Two differents levels of CPU time occupation due to the asymetry of this scheme. But well, it works, and I'm quite happy of this. For the record, the first experiments were done in 2004 in the Crau'04 Party.